Data champions play a crucial role in making data governance successful. The data champions are enthusiastic about the power of data and in just about every company that has successfully implemented data governance, they often lead the way. 1. Passion. 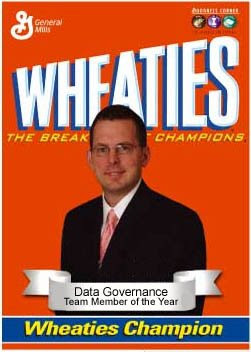 Champions are passionate about data governance and promote its benefit to all whom they meet. They are the vision of data governance, developing new efficient processes and working through any issues of non-cooperation that arise. If the data champion finds him/herself losing your passion for data management, it’s time for regime change. 2. Respect. A data champion is someone who is the glue between executives, business, IT and third-party providers. The data champion role requires someone who has both technology and business knowledge – someone who can communicate with others and build relationships as needed. In a way, a data champion is a translator, translating the technologist’s jargon of schemas and metadata into business value, and vice versa. To do that, you really need to understand what makes all sides tick and have the respect of the team. 3. Maven-dom. A ‘maven’ is someone who wants to solve other people’s problems, generally by solving his own, according to Malcom Gladwell, author of The Tipping Point (and another good book for data champions to read). A maven’s social skills and ability to communicate are powerful tools in evangelizing data governance. A data champion needs to be socially connected and willing to reach out and to share what is known about data governance. It is not easy for some to create and maintain relationships. If you’re the type of person who prefers closing the office door to avoid others, you may not be an effective data champion. 4. Persuasiveness. One of the success traits of a good data champion is that they have vision and they can sell it. Working with others within your organization to develop a vision is important, but the data champion is the primary marketer of the vision. Successful data champions understand the power of the elevator pitch and are willing to use it to promote the data governance vision to all who will listen. The term elevator pitch describes a sales message that can be delivered in the time span of an elevator ride. The pitch should have a clear, consistent message and reflects your goals to make the company more efficient through data governance. The more effective the speech, the more interested your colleagues will become. 5. Positive Attitude. A data champion must smile and train themselves to think positively. Why? Positive thinking is contagious and your optimism will build positive energy for your project. Data champions smile and speak optimistically to give others the confidence to agree with them. As a champion, you will encounter negative people who will attempt to set up road blocks in front of you. But as long you’re optimistic and respond positively, you will inspire team members to join your quest and share in your success. where author John Maxwell identifies areas for you to work on. Those are my top six qualities of a data champion. You’ll notice that I didn’t particularly put anything about technical expertise, although it is implied in number two. That’s because being a data champion is as much about managing people and resources than it is about technical know-how.